Model-View-Controller (MVC) is a design pattern put together to help control change. MVC decouples interface from business logic and data. Model : The model contains the core of the application's functionality. The model encapsulates the business logic of the application.It knows nothing about the view or controller. View: The view provides the presentation to the user. It will show the view components to the user. Controller:The controller reacts to the user input. It creates and sets the model. Q) What is a framework? A framework is made up of the set of classes and interfaces which allow us to use a library in a best possible way for a specific requirement.Framework provides facilities to do the common functionality in the application development. Q) What is Struts framework? Struts framework is an open-source framework for developing the web applications in Java EE, based on MVC-2 architecture. It uses and extends the Java Servlet API. Struts is robust architecture and can be used for the development of application of any size. Struts framework makes it much easier to design scalable, reliable Web applications with Java. Q) What are the components of Struts? Model: Components like business logic /business processes and data are the part of model. View: HTML, JSP are the view components. Controller: Action Servlet of Struts is part of Controller components which works as front controller to handle all the requests. Q) What are the core classes of the Struts Framework? Struts is a set of classes, servlets, and JSP tags that make up a reusable design. 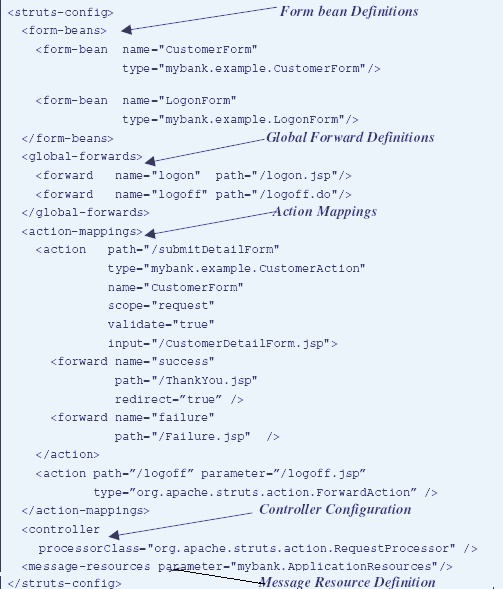 Java Beans components for managing application state and behavior. Event-driven development (via listeners as in traditional GUI development). Pages that represent MVC-style views; pages reference view roots via the JSF component tree. Q) What is ActionServlet class? ActionServlet is a simple servlet which is the backbone of all Struts applications. It is the main Controller component that handles client requests and determines which Action will process each received request. It serves as an Action factory – creating specific Action classes based on user’s request. Q) What is role of ActionServlet class? Q) What is the ActionForm class? 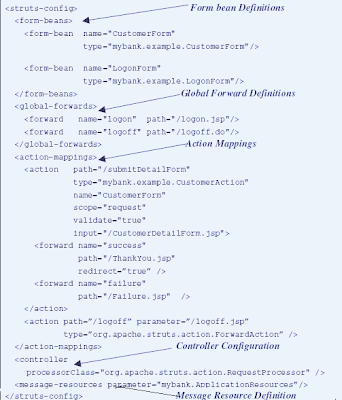 Action Form is javabean which represents the form inputs containing the request parameters from the View referencing the Action bean. Q) What are the important methods of ActionForm class? The important methods of ActionForm are : validate() & reset(). Q)Describe validate() and reset() methods in Action form class? validate() : Used to validate properties after they have been populated; Called before FormBean is handed to Action. Returns a collection of ActionError as ActionErrors. Following is the method signature for the validate() method. reset(): reset() method is called by Struts Framework with each request that uses the defined ActionForm. The purpose of this method is to reset all of the ActionForm's data members prior to the new request values being set. Q).What is ActionMapping in struts-config.xml file? Q) How is the Action Mapping specified ? Q) What is role of Action Class? An Action Class performs a role of an adapter between the contents of an incoming HTTP request and the corresponding business logic that should be executed to process this request. Q) In which method of Action class the business logic is executed ? In the execute() method of Action class the business logic is executed. Q) Can we have more than one struts-config.xml file for a single Struts application? Q) What is the directory structure of Struts application? Q) What is the difference between session scope and request scope when saving formbean ? Q) What are the important tags of struts-config.xml ? Q) What are the different kinds of actions in Struts? The DispatchAction class is used to group related actions into one class.Using the Dispatchaction we can reduce number of action class in the application . you can have a method for each logical action compared than a single execute method. The DispatchAction dispatches to one of the logical actions represented by the methods. It picks a method to invoke based on an incoming request parameter. The value of the incoming parameter is the name of the method that the DispatchAction will invoke. Q) How to use DispatchAction? Q).What is the use of ForwardAction? The LookupDispatchAction is a subclass of DispatchAction. It does a reverse lookup on the resource bundle to get the key and then gets the method whose name is associated with the key into the Resource Bundle.LookupDispatchAction is useful if the method name in the Action is not driven by its name in the front end, but by the Locale independent key into the resource bundle. Since the key is always the same, the LookupDispatchAction shields your application from the side effects of I18N. Q) What is difference between LookupDispatchAction and DispatchAction? Q) What are the steps need to use DynaActionForm? Q) How to display validation errors on jsp page? 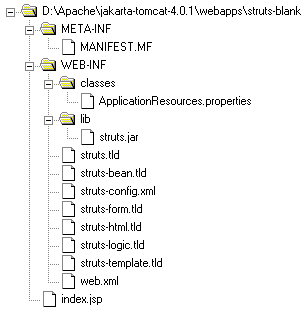 Q) What are the various Struts tag libraries? Q) What is the use of logic:iterate? logic:iterate> repeats the nested body content of this tag over a specified collection. < bean:message>: is used to retrive keyed values from resource bundle. It also supports the ability to include parameters that can be substituted for defined placeholders in the retrieved string. < bean:write>: is used to retrieve and print the value of the bean property. has no body. Q) How the exceptions are handled in struts? Programmatic exception handling : Explicit try/catch blocks in any code that can throw exception. It works well when custom value (i.e., of variable) needed when error occurs. Declarative exception handling :You can either define handling tags in your struts-config.xml or define the exception handling tags within tag. It works well when custom page needed when error occurs. This approach applies only to exceptions thrown by Actions. Q) What is difference between ActionForm class and DynaActionForm class? Q) How can we make message resources definitions file available to the Struts framework environment? Q) What is the life cycle of ActionForm?